Interpreting the Aura requires you to learn color definition, you should also become familiar with the location of the color and how the two relate to each other. The location, consistency and clarity of a color within the aura helps with interpreting the aura and to determine their full meaning. As you become more proficient at interpretation of the aura so you will see and understand more. A clear, vibrant, and consistent yellow about the head indicates intelligence, wisdom, and success. But if just one of these parameters is modified, the meaning of the color can change. A vibrant yellow around the chest area could indicate compassion, patience and a willingness to give. You may see a color localized in a specific area (as in the example above). But if you look at the entire aura overall when interpreting the aura, regardless of layers or color, you may see a hole in the aura. This could indicate a dysfunction in the physical body, such as disease or injury. In most cases the injury or illness may not even be apparent in the physical, but rather is in the beginning stages. This type of deformity in the aura is indicative of long standing problems, such as ulcers, cancer etc. Physical ailments use a great deal of energy to form within the body. The hole is an indication that the body is drained of its recuperative powers and is being forced to pull energy from outside itself in order to feed a symptom inside the body. In some cases you might see a dent in the aura in a particular location. The aura is not always perfectly egg shaped as often seen in pictures or books. It can be completely flat on one side, or "s" shaped on another. This can occur for two reasons. The most common is an intrusion or interruption has occurred to the subject. You can learn much more about how to interpret your aura, how to balance the aura and how to work with your whole energy body to nick dis-ease at source and start you healing journey. Indicate spiritual expansion, expressiveness, extroversion, social activity, desire for connection, gregariousness, positive outlook, and a sense of adventure. Indicate inward focus, sensitivity, a desire for solitude, meditation, peace, tranquility, or rest. This could mean a need to express or move out. While learning to interpret the aura it is important for you to protect yourself. If a person walks past, very close to you, they may unintentionally steal some of your energy, hence the importance of protecting your energies on a daily basis. The same happens if someone suddenly reaches out and grabs your arm, they are interrupting the flow of energy around your body. An example of this might be a time when you were talking to someone and you thought they were standing to close to you. You may have even thought to yourself, "they're in my space" and backed away. Even this slight intrusion into your aura or "space" can interrupt the flow of energy. The second cause is similar to seeing a hole in the overall aura. Curves or dents in the aura can also be an indication that a physical injury has occurred and the body is pulling energy in to heal itself. The key to interpreting the aura in these cases is look at the color associated with the disfigurement. If the major color around the dent, for instance, is green, then the deformity probably indicates an illness. If however, the color is lavender, this it is more likely that an interruption of the energy field has occurred. As you practice interpreting the aura, observe and work with auras you will develop your knowledge and interpretation of the aura by trusting and listening to your intuition. Right side, (pictures left): This is the person's masculine energy. It is their expressive and active side, how one projects oneself to the world. It is more straightforward and physical, less emotional. Colors on this side may have to do with physical changes, memories or goals. It is the energy that is moving out, or, the recent or far past. Center, (above the head): This is the energy of the moment, usually in the colors that the person traditionally reflects. The closer the colors are, the more intensely they are thinking about or experiencing them. If there is a band of color stretching like an arc over the top of the photo, this is indicative of an important goal. Left side (picture's right): This is the person's feminine side. This is their passive and receptive side. This is the emotional and imaginative side. This side is indicative of what a person is projecting into the future. It is the energy that is moving in. The person may not be aware of it yet consciously. 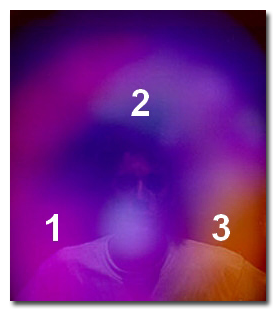 Patterns in the aura indicate general health and areas of weakness. Layers within the pattern may change color, shape or location, but this usually occurs gradually and overtime. As a person's general attitude and health changes, so does the primary energy field around the body. Every action, physical or mental, creates energy and affects the aura. Therefore, when interpreting the aura it is important to understand that sudden emotions or thought patterns can generate instant energy patterns or peaks in the energy flow. This type of energy appears as a spike shooting out from one part of the body or as a lightening bolt across the entire aura. Emotions or sudden thought patterns may not last for a long period of time; therefore the energy they produce is also quick and sudden. In time you will learn to correlate what you see or feel with the person's emotional health and physical well being. Compliment your knowledge on how to interepret the aura with the knowledge of how to balance, protect and heal this very important and vital part of your energy body.